The View-based Modeling Framework is one of the contributions of the Research Group Software Architecture (SWA), Faculty of Computer Science, University of Vienna, Austria to the EU FP7 INDENICA project. In INDENICA, the notion of Virtual Service Platforms (VSP) is introduced to shield the investments into service-based applications against potential external negative influences and threats such as the heterogeneity of the involving service platforms, service discontinuation, service evolutions, etc. The view-based design time and runtime architecture is proposed for developing and tailoring VSPs. This approach enables each stakeholder to work with the most appropriate views for his current work tasks. The Model-Driven Software Development paradigm shall be exploited in order to separate the levels of abstraction. That is, high-level, technology- and domain- independent concepts and elements are separated from the technology- and domain-specific ones. This way, we can better support stakeholders in formulating and tailoring a particular VSP that integrates different service platforms. More details on the View-based Design Time and Runtime Architecture for Tailoring Virtual Service Platforms can be found in D3.1. The INDENICA View-based Modeling Framework (VbMF) is developed and bundled in terms of Eclipse plug-ins which currently work stably in Eclipse Indigo (3.7.x). After installing Eclipse, EMF, GMF, and Xtext, point Eclipse to the VbMF update site:  or download the whole VbMF plugins and features in terms of an Eclipse UpdateSite bundle. After decompressing it, you can go to Eclipse > Help > Install New Software > Add > Local, and point to the decompressed folder. VbMF can be chosen and install from the Eclipse Repository Manager. High-level Service Component View (SCV): this is the central architectural view of a VSP that represents key building blocks of the VSP using the notions of components, ports, and connectors. Low-level Service Component View for SCA 1.0 (aka SCA View for short): As SCA has been exemplified for realizing VSP runtime in INDENICA, we define a low-level counterpart of the high-level Service Component View for this purpose. 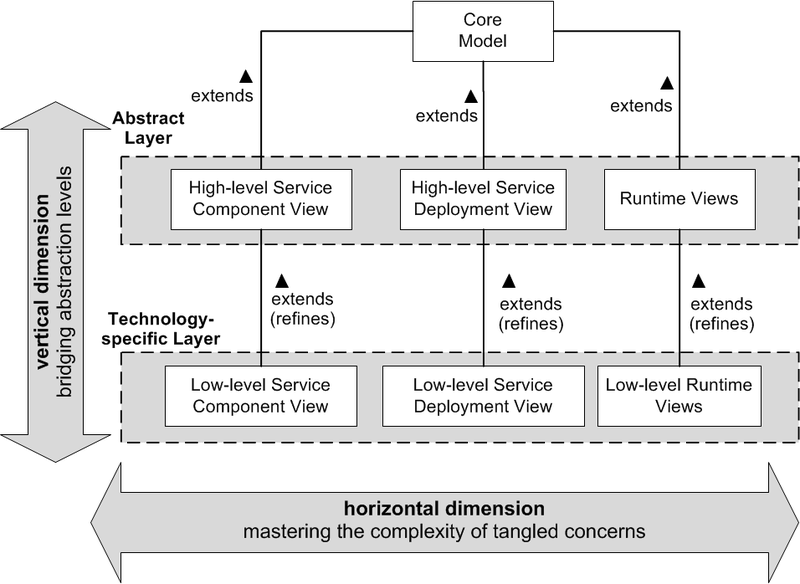 For better supporting view refinement, the SCA View comprises of two parts: a nearly one-to-one view model refinement of the high-level concepts of the Service Component View and a complementing Generator DSL. Mapping DSL is used to define the refinement from high-level SCV to the SCA view. Deployment View is for describing the assignment of SCA composites (aka artifacts) to the runtime nodes. Generator DSL is used for specifying the SCA-specific bindings, interfaces, implementation, etc. Generator DSL also supports for Java-based proxies specification and generations. VbMF is open-sourced under the BSD-2-Clause License.